Ham Radio Audio bulletin newsplayer. 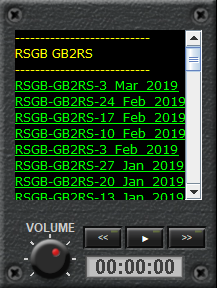 Currently supporting RSGB GB2RS, This week in Amateur Radio, Amateur Radio Newsline, ARRL Audio News, VK6 NewsWest broadcast, ICQ Ham Radio Podcast. But more to come. Player has fastforward and fastbackward, play and pause. Separate Volume knob.